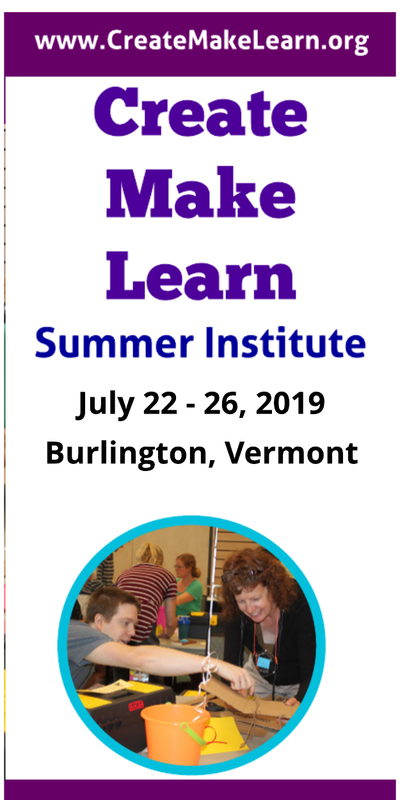 Create Make Learn Summer Institute encourages educators to set their own personal goals for creating, making, and learning. We then structure the schedule and organize resources (including mentors) to help you reach those goals. 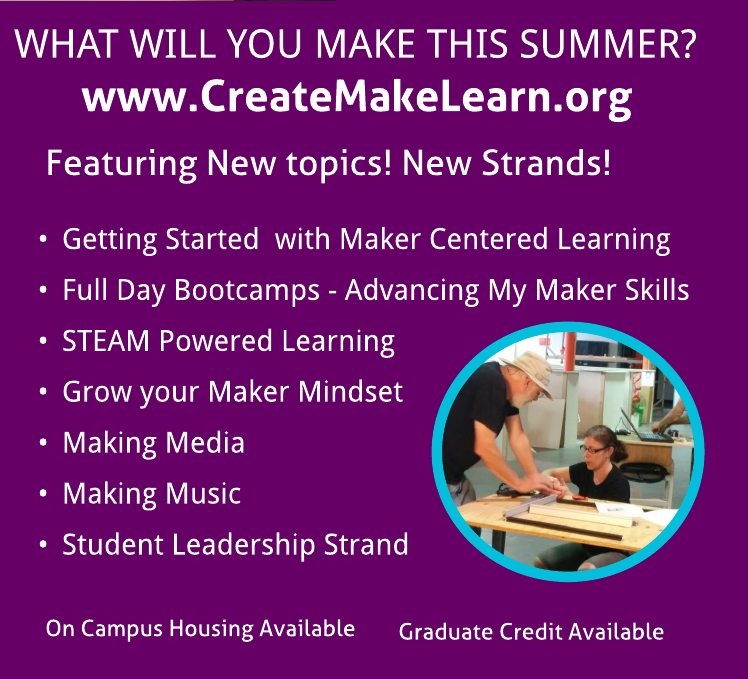 When Ellen Arapakos, librarian from Williston Central School signed up for Create Make Learn Summer Institute, she shared her goal to build her own 3D printer. We've had several educators start and complete a 3D printer build at Create Make Learn, so we were prepared to help her meet that goal! Ellen totally impressed up on Day 1 when she walked in with her Prusa 3D printer already assembled. When her kit arrived on July 25 (a week before the summer institute), she dove right in and started building. Four days later, she had an assembled 3D printer. But her 3D printer build ended with a challenge - it would not successfully calibrate. 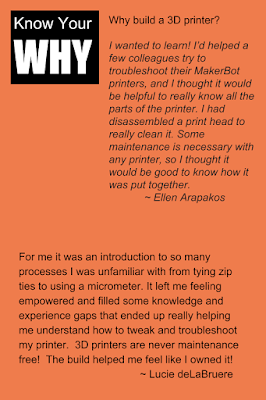 Ellen shared that "All the electronics, fan, thermistor worked, all the parts were in the right place, but the print bed did not move far enough in the Y (front to back axis)." We listened to Ellen describe her process so far. When I saw the Haribo gummies included in the box, I felt this was packaged by like-minded thinkers. I really like looking at pictures and assembling what I see. I’m the kind of person who thinks putting together Ikea furniture is fun. My belief in the likely success of the endeavor swung back and forth. The company’s fun, egalitarian, anyone-can-do-this online presence belied the precision required in some assembly steps. Ellen persevered and worked towards the the last step in the build. But then she hit a barrier. There sat a fully assembled 3D printer, with all its fans humming and software running….yet the print bed was too far off axis to print. The more I tried to adjust the base, the worse I made the problem. I felt completely discouraged! I could just see the finish line, but not find a way across it. 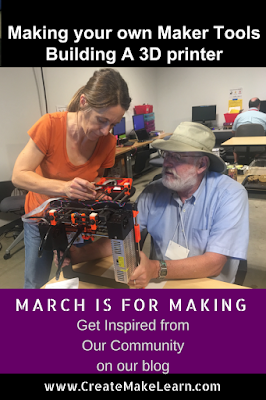 Ellen showed up at the Create Make Learn Summer Institute with her 3D printer in hand and found the help she needed when Craig Lyndes helped her work through the barrier she had encountered. Yeah for Create! Make! Learn! camp! !😊😀 I was assigned a special camp counselor 😉to help me with my project. I had my own personalized learning plan! Having an incredibly patient person work with me and think it through was the trick. I had gotten so frustrated and angry by the end of it, I wasn’t able to correctly think spatially about the way the screws and bolts needed adjusting to move the bed to the axis location needed. It was great to see Ellen's joy as her printer printed its first 3D print and to hear her say she would do it again if given the choice. Actually, I wish I could do it again because I think I’d do a much better job building the printer! The fact is, however, I can’t. Disassembling it really isn’t a good option; there are so many zip ties and little screws that wouldn’t benefit from a rebuild. Given that, I do sometimes think I would better off from a printing perspective with the fully assembled model. As you can see from this short video, she loved the learning. She loved working with her hands, and has a sense of satisfaction to having assembled her own 3D printer. When I asked Ellen why she chose a kit instead of a pre-built printer, I could really relate to her answer. I wanted to learn! I’d helped a few colleagues try to troubleshoot their MakerBot printers, and I thought it would be helpful to really know all the parts of the printer. I had disassembled a print head to really clean it. Some maintenance is necessary with any printer, so I thought it would be good to know how it was put together. Ellen had done her research. 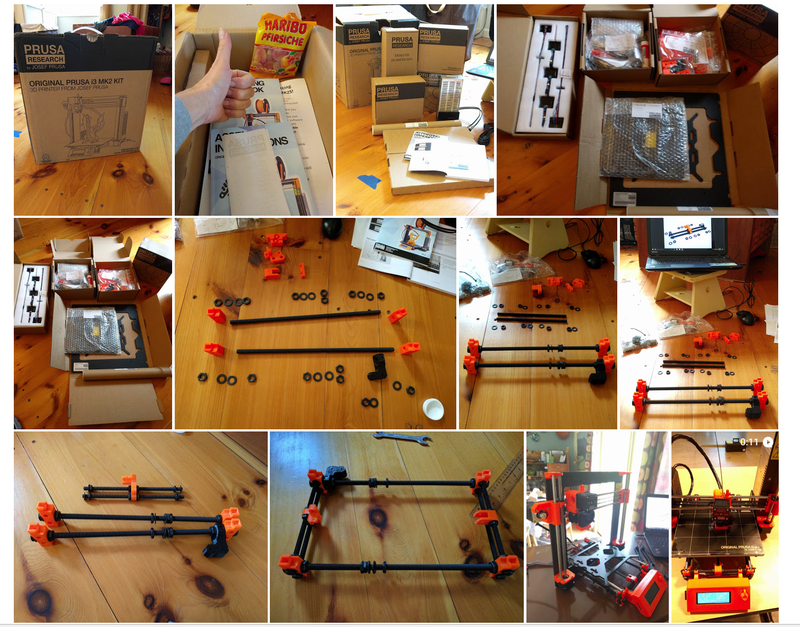 The Prusa i3MK2 was top rated by Make magazine, and the kit was under $800. The price point was a huge incentive for her. "A Makerbot Replicator, which many schools have, is well over $2,000. If you want MakerCare service, that’s even more money." Ellen's students are currently preparing for Vermont's annual competition - 3D Vermont , so the printer is about to go into high use mode. She's a little nervous because the printer has been moved around quite a few times this year due to a building construction project. She's also concerned about recalibrating the printer. Because of the nature of her job as a librarian, she is frequently away from her desk helping others. That makes it hard to keep an eye on the print as it goes from its first layer to completion. But at least there is a printer for her students to use as they prepare for the state competition and it's the one that Ellen built herself! When deciding whether to build a 3D printer or not, ask yourself why? If your goal is to experience the empowerment of making your own maker tools, then a 3D printer build might be right for you. That feeling of empowerment that Ellen described was one that I had experienced myself, four years ago as I built my first 3D printer on a picnic table in Austin, Texas. Here is a blog post with videos of the build. I remember the feeling of accomplishment scraping the first print off the print bed knowing it came from a machine that I had assembled. It was like a mini course in mechanical engineering over the course of a long weekend. When I started I didn't even know how to to tie a zip tie or tighten a hex nut. I was lucky enough to have Craig by my side. He left me to the build, but would come over to help when I had questions. Throughout this build I learned so much about tools and techniques for making! And best of all I would know how to tweak my 3D printer when it needed calibration - something most 3D printers need throughout their lifespan. Since then, Craig and I have organized and lead a community 3D printer build at Champlain Mini Maker Faire (blog post) with over 50 participants from age 5 to 75! But in each of these builds, there was one common element--the support of the maker community! The process of building the 3D printer is a natural process for connecting with other makers. 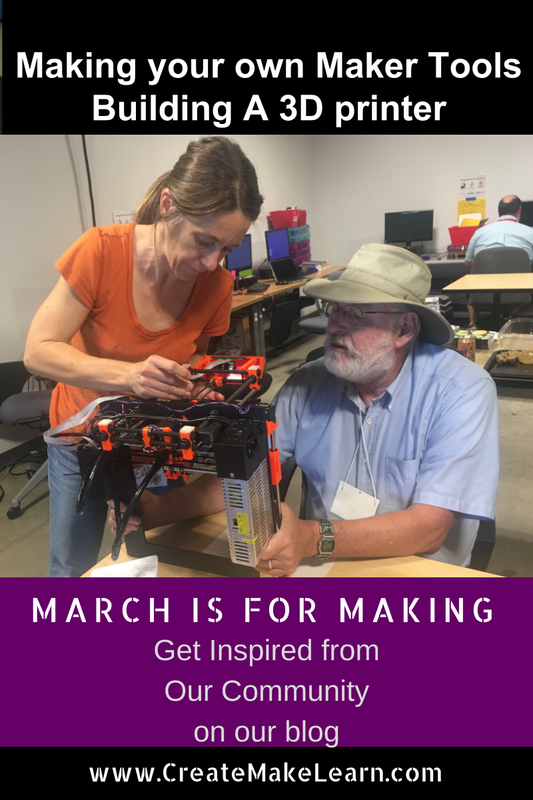 Whether it;s to help you overcome a barrier, or to help you develop the skills you need to complete the build, or to just join in the fun, make sure to connect with others if you're going to take on the empowering tasks of building your own 3D printer.